"We were very nervous waiting to see how the storms unfolded', said Kathy Lammers, President of the Caribbean Sailing Association. "Antigua was fortunate to receive only tropical storm force winds and very little damage, although many neighbouring islands were not so lucky. So it's business as usual in Antigua and in many islands in the region, and even those that were badly damaged are working hard so we can all ensure that the Caribbean sailing season will carry on as normal. We look forward to welcoming sailors from all over the world as usual this season. The RORC Caribbean 600 wouldn't be the same without Antiguan dentist, Bernie Evan-Wong who is the only sailor to have competed in every race as skipper. Looking forward to competing for the 10th time in Taz, his Reichel Pugh 37, he explains: "Antigua was extremely lucky to not have a direct hit and to come through the devastating hurricanes unscathed. We will be looking forward to a bumper fleet for this celebratory edition of the race and I can absolutely promise a fantastic welcome to everybody who takes part in the RORC Caribbean 600, especially this year." 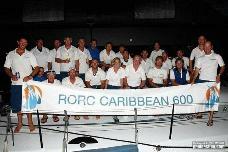 For the 10th anniversary of the RORC Caribbean 600, many past participants have already indicated 2018 entries. George David - the current record holder with Rambler 100 in 2011 - is coming back with Rambler 88, determined to win again: "Rambler was designed for the great sailing conditions we see in the Caribbean and this has to be a favorite of all the 600 classics," commented David. "The hurricanes this season have been devastating to somany locations but fortunately Antigua was spared the worst. Let's all come back together."